Dr. Anthony Cannella was born and raised in Tampa, FL. After completing his bachelors of science degree at the University of South Florida, he obtained a masters of science from Barry University; during this time, he gained experience by working on a research project on vaccine candidates for malignant melanoma in a local, private research laboratory. 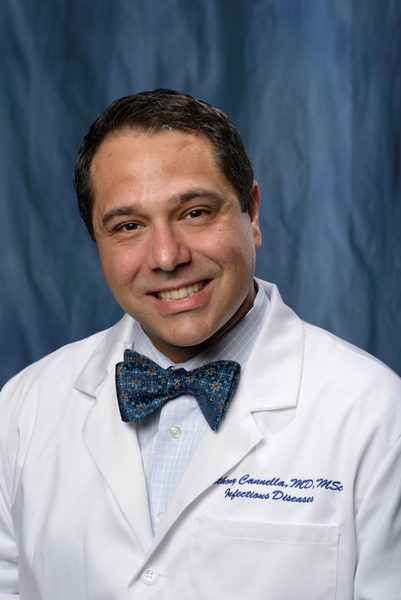 In 2006, he obtained his doctor of medicine degree from the University of South Florida, and subsequently in 2009, completed the Internal Medicine Residency Program at the University of Alabama at Birmingham. There, he received both accolades for teaching and as the first recipient for the TiME-R program, where he gained research experience in investigational immunological techniques. This experience was what placed him on the path of becoming a physician-scientist, and led him to the University of California, San Diego for his Infectious Diseases Fellowship. There, he became intrigued by with host-pathogen interactions, and more specifically, adaptive immune responses to pathogens. This led him to join the laboratory of a large international neglected tropical medicine research group. Working in conjunction with the La Jolla Institute of Allergy and Immunology, Dr. Cannella successfully identified the first T cell epitopes for Brucella melitensis, which are now providing the bedrock for both future important diagnostic and vaccination research for brucellosis. During this time, he became a Clinical Instructor, where he attended on the consult service, as well as Associate Director of the Medical Microbiology Course, where he also demonstrated one of his other passions, teaching students, residents and fellows. In 2013, he was promoted to Assistant Professor of Medicine at UC San Diego after successfully competing for a K-08 grant. He is now an Assistant Professor of Medicine at UF-COM/EPI in the Division of Infectious Diseases/Department of Medicine. Dr. Cannella’s primary research interests are how the human immune system interacts with pathogens, and more specifically how the adaptive immunity plays a role in this process of controlling the infection. He is interested in the adaptive immune response differences between asymptomatic patients and symptomatic patients of neglected tropical diseases, more specifically: Plasmodium (malaria), Mycobacteria tuberculosis, vector-borne viruses, and Leptospira spp. His current project revolves around elucidating the mechanisms of how some individuals respond to an infection, demonstrated by their cytokine profiling of these individuals’ T helper cell responses (Th1/Th2/Th17/Threg) and even measurement of B cell memory capacity. Dr. Cannella believes that these fundamental immune differences between asymptomatic patients and symptomatic patients can hold the key to understanding how certain pathogens can not only evade the immune system, but also inducing a response, which could impede immune control of the organism. Cannella AP, Oehler R. Case Report: Streptococcus constellatus Bacterial Endocarditis w/ Multiple Embolic Secondary Infection. Infections in Medicine; November 2007. Cannella AP, Nguyen BM, Piggott CD, Lee R, Vinetz JM, Mehta S. A Cluster of Cutaneous Leishmaniasis Associated with Human Smuggling. Am. J. Trop. Med. Hyg., 84(6), 2011, pp. 847–850 PMID: 21633017 doi:10.4269/ajtmh.2011.10-0693. King J, McCall M, Cannella AP, Markiewicz MA, James A, Hood CB, Acosta EP. A Randomized Crossover Study to Determine Relative Bioequivalence of Tenofovir, Emtricitabine, and Efavirenz (Atripla) Fixed-Dose Combination Tablet Compared With a Compounded Oral Liquid Formulation Derived From the Tablet. JAIDS (Journal of Acquired Immune Deficiency Syndromes) 56(5):e131-e132, April 15, 2011. PMID: 22046602. Cannella AP, Lin JC, Liang L, Atluri V, Gotuzzo E, Felgner PL, Tsolis RM, Vinetz JM. Serial Kinetics of the Antibody Response Against the Complete Brucella melitensis ORFeome in Chronic Human Brucellosis. J Clin Microbiol. 2012 Mar;50(3):922-6. doi: 10.1128/JCM.05298-11. Epub 2012 Jan 4. PMID: 22219303. Cannella AP, Tsolis RM, Liang L, Felgner PL, Saito M, Sette A, Gotuzzo E, Vinetz JM. Front Cell Infect Microbiol. Antigen-specific acquired immunity in human brucellosis: implications for diagnosis, prognosis, and vaccine development Frontiers in Cellular and Infection Microbiology 2012;2:1. doi: 10.3389/fcimb.2012.00001. Epub 2012 Feb 1.PMID: 22919593. *McKinnell JA, *Cannella AP, Kunz DF, Hook EW 3rd, Moser SA, Miller LG, Baddley JW, Pappas PG. Pneumocystis Pneumonia; A Detailed Examination of Symptoms, Management, and Outcomes in HIV-infected and HIV-uninfected Persons Transpl Infect Dis. 2012 Oct;14(5):510-8. doi: 10.1111/j.1399-3062.2012.00739.x. Epub 2012 May 1.PMID: 22548840 *: Co-first author. Brucella melitensis T cell Epitope Recognition by Humans Recovered From Brucellosis in Peru” Infect Immun. 2013 Oct 14. PMID: 24126518. Pathogenomic Inference of Virulence-Associated Genes in Leptospira interrogans PLoS Negl Trop Dis. 2013 Oct 3;7(10):e2468. PMID: 24098822. Am J Transplant. 2014 Apr;14(4):982-3. doi: 10.1111/ajt.12655. PMID: 24666835.